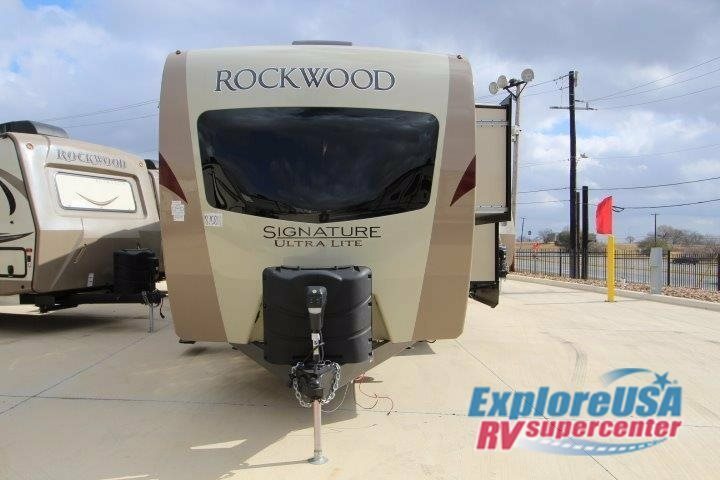 2010 Forest River Rockwood Signature Ultra Lite M-8317SS . 33 foot long Travel Trailer Model 8317SS in excellent condition- Quad Bunk beds for the Kids- Includes 2 LCD TVs for the Ultimate Entertainment within- Power Patio Awning- Awning Topper over Slide out- Digital Antenna. Not very many trips have been made with this particular Unit- Central Air- Kitchen with a Microwave Propane Stove and a Refrigerator- Will also include 4-Slot Bike Rack- Spare Tire and Carrier equipped- Surround Sound with 3-Zones - including Outside speakers too- Also willing to include Weight Distribution hitch as well- Only weighs 6212 Pounds when empty- This is a must see Travel Trailer and everything works well- Serious inquiries only. This RV is currently located in Findlay OH. . Qualified buyers may be eligible for Financing Nationwide Shipping and Extended Warranties. 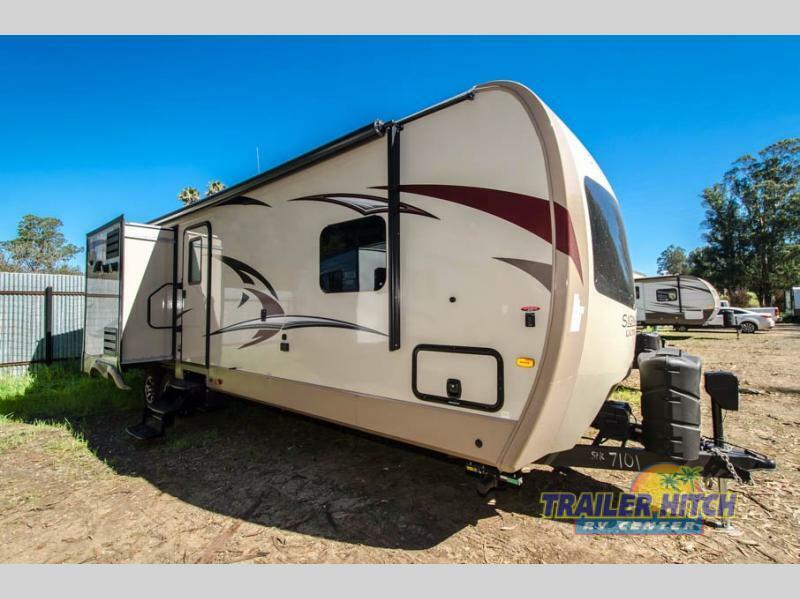 2018 Forest River RV Rockwood Signature Ultra Lite 8326BHS, Sleeping for ten can be found in this QUAD slide Rockwood Signature Ultra Lite travel trailer with a bunkhouse! Step inside model 8326BHS and notice the front bedroom with queen Serta bed including nightstands on both sides, and a shirt closet along the curb side front. There is overhead cabinets, and a slide out wardrobe with storage shelves. Double sliding doors offer easy access to either side, and there is a standard TV for viewing as well.In the combined kitchen and living space you will enjoy a large slide out 67" hide-a-bed sofa and 44" booth dinette. Both can be made into added sleeping space when needed at night. The kitchen is opposite the slide and features an L-shaped counter including a c-top extension. Here you can cook up light meals and snacks easily with a refrigerator, and a three burner range including an overhead microwave oven. You will also love the double sink for cleaning up. Further on back along the curb side you will find a complete bath with a radius shower, toilet, and vanity with sink plus medicine cabinet. There is a handy wardrobe opposite the bath door for clothing storage, or perhaps extra towels and toiletries. A pocket door separates the living space from the rear bunkhouse that easily sleeps five individuals. There are dual opposing slides with a sofa including a flip up bunk above along the road side or choose a hide-a-bed sofa option, and a slide out set of bunks along the curb side. Along the rear wall you will find an optional entertainment center with flip up counter-top, and a table.On the outside the chef in the family will love the outdoor kitchen with a swing-out stove including a sink, refrigerator, counter space, and a shelf. There is a generous pass through storage compartment up front, a gas grill option, and two awnings for added outdoor space providing protection from the elements, plus so much more! 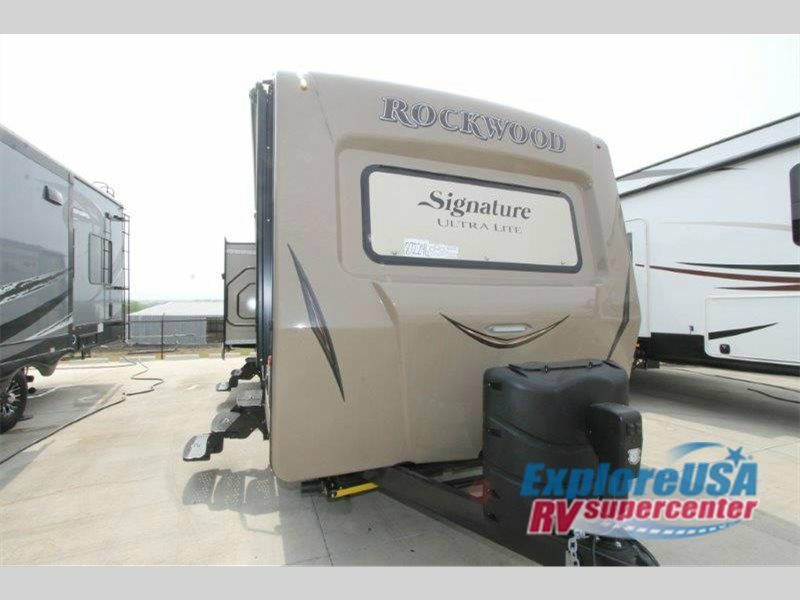 2017 Forest River RV Rockwood Signature Ultra Lite 8326BHS, Sleeping for ten can be found in this QUAD slide Rockwood Signature Ultra Lite travel trailer with a bunkhouse! Step inside model 8326BHS and notice the front bedroom with queen Serta bed including nightstands on both sides, and a shirt closet along the curb side front. There is overhead cabinets, and a slide out wardrobe with storage shelves. Double sliding doors offer easy access to either side, and there is a standard TV for viewing as well.In the combined kitchen and living space you will enjoy a large slide out 67" hide-a-bed sofa and 44" booth dinette. Both can be made into added sleeping space when needed at night. The kitchen is opposite the slide and features an L-shaped counter including a c-top extension. Here you can cook up light meals and snacks easily with a refrigerator, and a three burner range including an overhead microwave oven. You will also love the double sink for cleaning up. Further on back along the curb side you will find a complete bath with a radius shower, toilet, and vanity with sink plus medicine cabinet. There is a handy wardrobe opposite the bath door for clothing storage, or perhaps extra towels and toiletries. A pocket door separates the living space from the rear bunkhouse that easily sleeps five individuals. There are dual opposing slides with a sofa including a flip up bunk above along the road side or choose a hide-a-bed sofa option, and a slide out set of bunks along the curb side. Along the rear wall you will find an optional entertainment center with flip up counter-top, and a table.On the outside the chef in the family will love the outdoor kitchen with a swing-out stove including a sink, refrigerator, counter space, and a shelf. There is a generous pass through storage compartment up front, a gas grill option, and two awnings for added outdoor space providing protection from the elements, plus so much more! 2017 Forest River RV Rockwood Signature Ultra Lite 8327SS, If you have been looking for more interior floor space in a travel trailer, a rear bunkhouse, a kitchen island, and an outside kitchen then stop your search! This QUAD slide Rockwood Signature Ultra Lite 8327SS by Forest River provides those features, plus much more!As you enter to your left there is a slide out refrigerator, three burner range, and microwave. Adjacent you can store your dry goods in the pantry. You will find plenty of counter space as well as a double kitchen sink on the center island. To the right of the entrance there is an entertainment center. The opposite side of the travel trailer has a dinette and a hide-a-bed slide with plenty of seating for the whole group.In the rear, you will find the bunkhouse with a slide out flip-up bunk and flip bottom bed. Across from the slide there is another upper bunk with a wardrobe, TV, drawer, and ladder.The bathroom is located toward the front of the travel trailer. Inside the bath there is a linen cabinet, radius shower, sink, medicine cabinet, and a toilet. A pocket door provides a second entrance into the bath from the bedroom.The front bedroom offers a slide with shelves and a wardrobe along the road side wall. There is a queen bed with nightstands and shirt closets as well as overhead storage. In the corner of the bedroom you can even choose an optional TV with standard backer. Outside you are sure to enjoy the exterior kitchen which has a refrigerator, sink, and swing-out two burner cook-top. If you enjoy grilling out, then choose the optional gas grill. 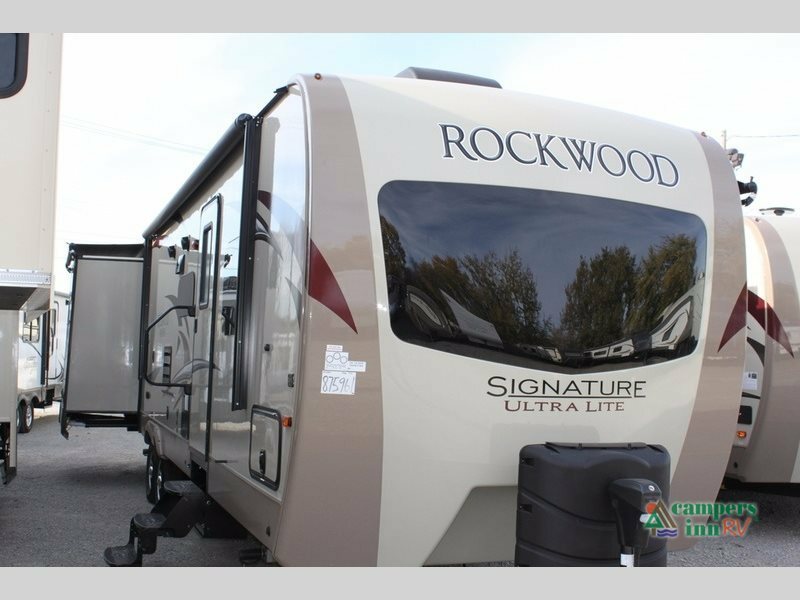 2018 Forest River RV Rockwood Signature Ultra Lite 8327SS, Wholesale Internet Price $ 34.49300 * Plus Add + $2,000 Freight to Dealer * TROPICAL RV'S WHOLESALE PRICES INCLUDE DEALER PREP , LP. TANKS FILLED AND A DEEP CYCLE BATTERY. 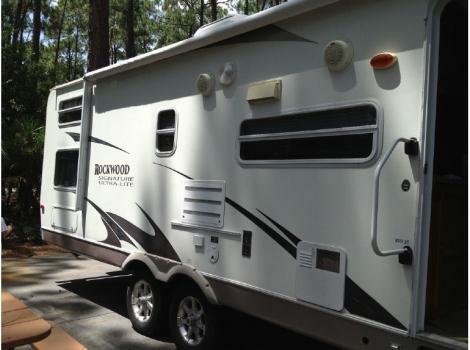 The Rockwood Signature Ultra Lite 8327SS travel trailer by Forest River offers quad slides with a rear bunk house.As you enter the travel trailer, to the left there is a slide with a refrigerator, and three burner range. You will find plenty of counter space as well as a double kitchen sink. To the right of the entrance there is an entertainment center. The opposite side of the travel trailer has a dinette and a hide-a-bed slide with plenty of seating for the whole group.In the rear, you will find the bunk house with a slide which has a flip-up bunk and a bottom bed. Across from the slide there is another set of bunks and nightstand. Wholesale Internet Price $ 34.49300 * Plus Add + $2,000 Freight to Dealer * TROPICAL RV'S WHOLESALE PRICES INCLUDE DEALER PREP , LP. TANKS FILLED AND A DEEP CYCLE BATTERY. The bathroom is located toward the front of the travel trailer. Inside the bath there is a linen cabinet, corner shower, sink, medicine cabinet, and toilet.The front bedroom offers a slide with shelves and a wardrobe. The queen bed has nightstands and shirt closets on either side of the bed. In the corner of the bedroom you can even choose an optional TV. You will also find a private entry door which leads outside for your convenience. Outside you are sure to enjoy the exterior kitchen which has a pantry, microwave, and refrigerator. If you enjoy grilling out, then choose the optional gas grill and much more! 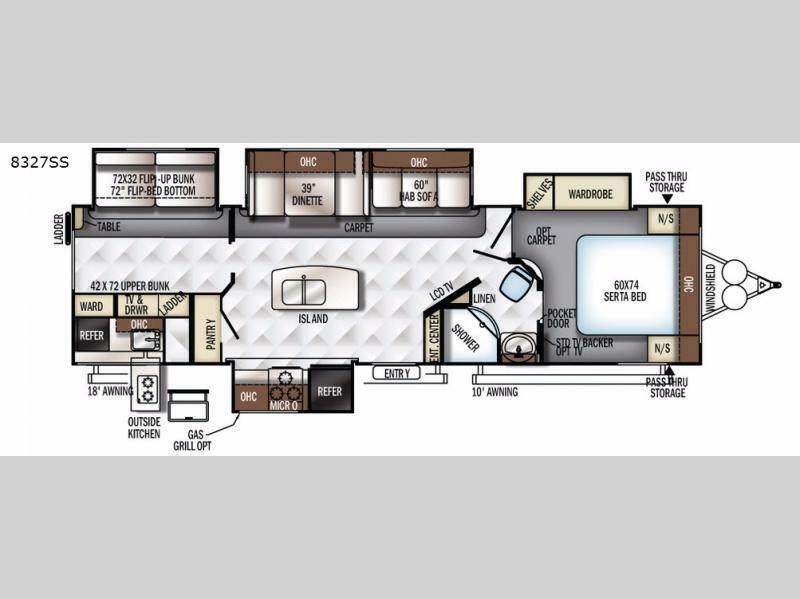 2017 Forest River RV Rockwood Signature Ultra Lite 8327SS, The Rockwood Signature Ultra Lite 8327SS travel trailer by Forest River offers quad slides with a rear bunk house.As you enter the travel trailer, to the left there is a slide with a refrigerator, and three burner range. You will find plenty of counter space as well as a double kitchen sink. To the right of the entrance there is an entertainment center. The opposite side of the travel trailer has a dinette and a hide-a-bed slide with plenty of seating for the whole group.In the rear, you will find the bunk house with a slide which has a flip-up bunk and a bottom bed. Across from the slide there is another set of bunks and nightstand.The bathroom is located toward the front of the travel trailer. Inside the bath there is a linen cabinet, corner shower, sink, medicine cabinet, and toilet.The front bedroom offers a slide with shelves and a wardrobe. The queen bed has nightstands and shirt closets on either side of the bed. In the corner of the bedroom you can even choose an optional TV. You will also find a private entry door which leads outside for your convenience. Outside you are sure to enjoy the exterior kitchen which has a pantry, microwave, and refrigerator. If you enjoy grilling out, you will surely enjoy the gas grill! 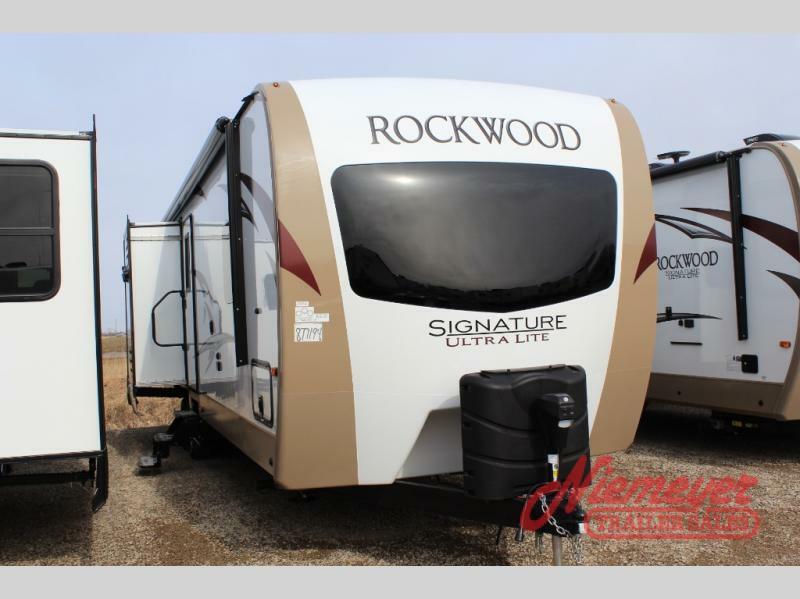 2017 Forest River RV Rockwood Signature Ultra Lite 8326BHS, Sleeping for eleven can be found in this quad slide Rockwood Signature Ultra Lite travel trailer by Forest River! Step inside model 8326BHS and notice the front bedroom with queen Serta bed including nightstands on both sides, and a shirt closet along the curb side front. There is an overhead cabinet, and a slide out wardrobe with storage shelves. Double sliding doors offer easy access to either side, and there is a standard TV for viewing as well.In the combined kitchen and living space you will enjoy a large slide out 67" hide-a-bed sofa and 44" booth dinette. Both can be made into added sleeping space when needed at night. The kitchen is opposite the slide and features an L-shaped counter including a c-top extension. Here you can cook up light meals and snacks easily with a refrigerator, and a three burner range including an overhead microwave oven. You will also love the double sink for cleaning up. Further on back along the curb side you will find a complete bath with a corner shower, toilet, and vanity with sink plus medicine cabinet. There is a handy wardrobe opposite the bath for clothing storage, or perhaps extra towels and toiletries.A pocket door separates the living space from the rear bunkhouse that easily sleeps six individuals. There are dual opposing slides with a 70" jack knife sofa with flip up bunk above along the road side, and a slide out 67" hide-a-bed sofa with flip up bunk above along the curb side. Along the rear wall you will find an optional TV with flip up counter-top, and two end tables.On the outside there is a generous pass-through storage compartment up front, a gas grill option, and two awnings for added outdoor space providing protection from the elements, plus so much more! 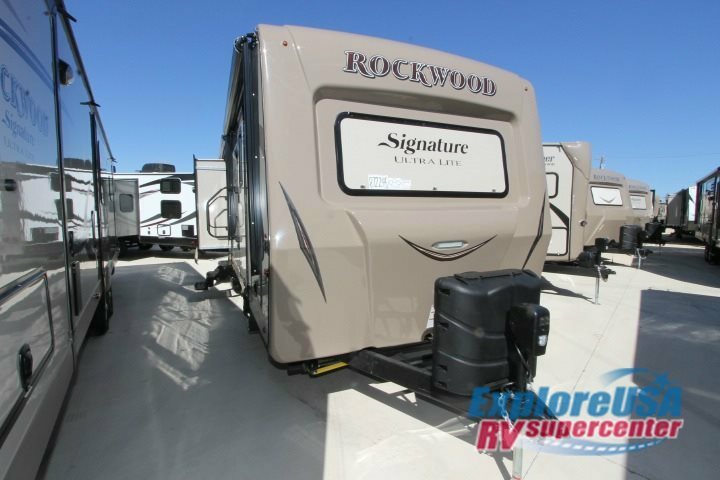 2017 Forest River RV Rockwood Signature Ultra Lite 8327SS, The Rockwood Signature Ultra Lite 8327SS travel trailer by Forest River offers quad slides with a rear bunk house.As you enter the travel trailer, to the left there is a slide with a refrigerator, and three burner range. You will find plenty of counter space as well as a double kitchen sink. To the right of the entrance there is an entertainment center. The opposite side of the travel trailer has a dinette and a hide-a-bed slide with plenty of seating for the whole group.In the rear, you will find the bunk house with a slide which has a flip-up bunk and a bottom bed. Across from the slide there is another set of bunks and nightstand.The bathroom is located toward the front of the travel trailer. Inside the bath there is a linen cabinet, corner shower, sink, medicine cabinet, and toilet.The front bedroom offers a slide with shelves and a wardrobe. The queen bed has nightstands and shirt closets on either side of the bed. In the corner of the bedroom you can even choose an optional TV. You will also find a private entry door which leads outside for your convenience. Outside you are sure to enjoy the exterior kitchen which has a pantry, microwave, and refrigerator. If you enjoy grilling out, then choose the optional gas grill and much more! 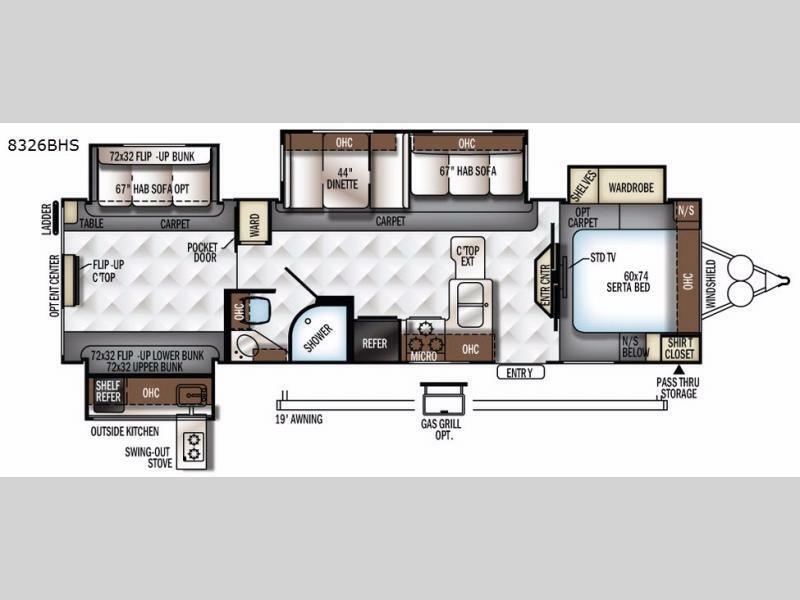 The Rockwood Signature Ultra Lite 8327SS travel trailer by Forest River offers quad slides with a rear bunk house.As you enter the travel trailer, to the left there is a slide with a refrigerator, and three burner range. You will find plenty of counter space as well as a double kitchen sink. To the right of the entrance there is an entertainment center. The opposite side of the travel trailer has a u-lounge with plenty of seating for the whole group.In the rear, you will find the bunk house with a slide which has a flip-up bunk and a bottom bed. Across from the slide there is another set of bunks and nightstand.The bathroom is located toward the front of the travel trailer. Inside the bath there is a linen cabinet, radius shower, sink, medicine cabinet, and toilet.The front bedroom offers a slide with shelves and a wardrobe. The queen bed has nightstands and shirt closets on either side of the bed. In the corner of the bedroom you can even choose an optional TV. You will also find a private entry door which leads outside for your convenience. Outside you are sure to enjoy the exterior kitchen which has a pantry, microwave, and refrigerator. If you enjoy grilling out, then choose the optional gas grill and much more! 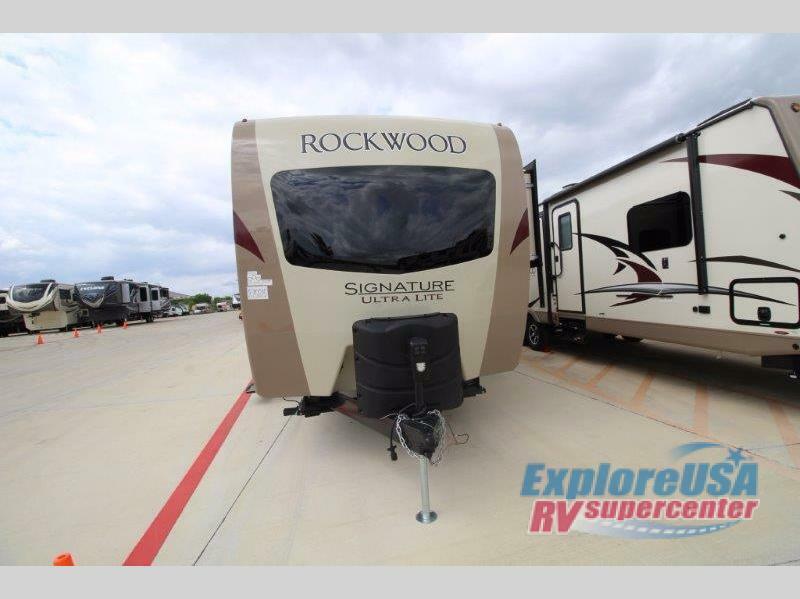 2016 Forest River RV Rockwood Signature Ultra Lite 8327SS, The Rockwood Signature Ultra Lite 8327SS travel trailer by Forest River offers quad slides with a rear bunk house.As you enter the travel trailer, to the left there is a slide with a refrigerator, and three burner range. You will find plenty of counter space as well as a double kitchen sink. To the right of the entrance there is an entertainment center. The opposite side of the travel trailer has a u-lounge with plenty of seating for the whole group.In the rear, you will find the bunk house with a slide which has a flip-up bunk and a bottom bed. Across from the slide there is another set of bunks and nightstand.The bathroom is located toward the front of the travel trailer. Inside the bath there is a linen cabinet, radius shower, sink, medicine cabinet, and toilet.The front bedroom offers a slide with shelves and a wardrobe. The queen bed has nightstands and shirt closets on either side of the bed. In the corner of the bedroom you can even choose an optional TV. You will also find a private entry door which leads outside for your convenience. Outside you are sure to enjoy the exterior kitchen which has a pantry, microwave, and refrigerator. If you enjoy grilling out, then choose the optional gas grill and much more!